April Showers — What Is She Wehring? I hope everyone is having a wonderful April so far! I am determined to make this MY month. What does that mean? Keeping myself accountable and getting things DONE! I have way too many drafts and unedited pictures that are just sitting on my computer. Plus spring is my all time favorite season so I, of course, have an abundance of new/bloggable clothes! Let's get into it! April is known for its rainy days and Florida does not disappoint on the precipitation scale. I was too obsessed with this outfit not to go out and face the elements to take a few photos. (with my new camera, I should add- still getting used to my DSLR) So here I am, post storm, in the fog, JUST FOR YOU. You're welcome. 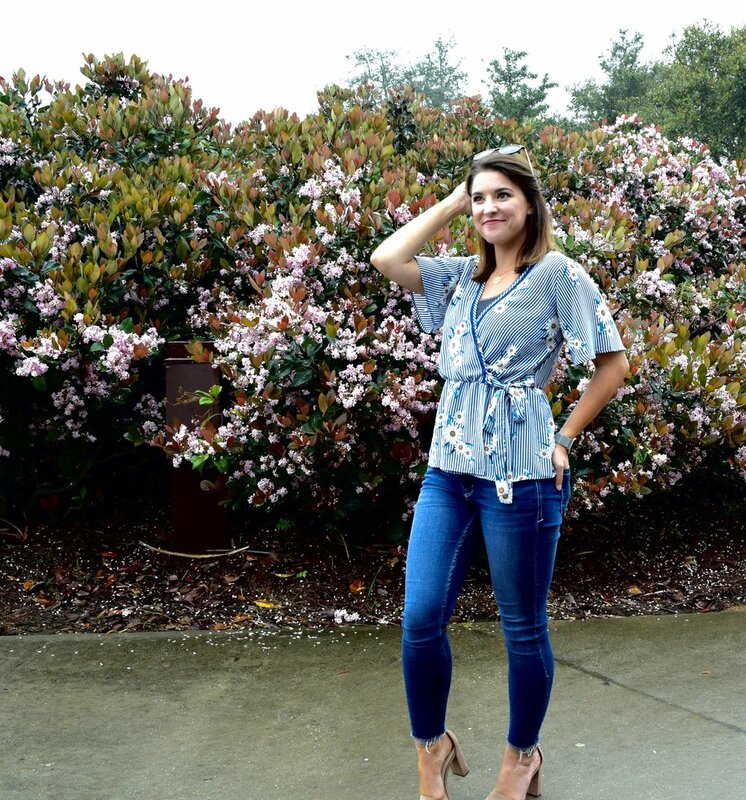 This top is a wonderful Marshall's find from the brand Sienna Sky. I have got to be honest, after buying/wearing this shirt, I have gone back to buy more tops from this brand. (I now have 4...I don't have a problem) It's got the cinched waist/peplum detail that I love so much! Get you a shirt that shows off your features! The jeans are brand new Kensie jeans and they have the oh so popular (at the moment) raw/frayed hem line at the ankles. The shoes are Nine West and I got them for a great deal at TJ Maxx. Don't overpay, ladies. Marshall's and TJ Maxx to the rescue!